Saturday 27th June 2009 @ 05.00Hrs GMT 10.30 local time mission complete,returning to base !! Well it's a bike ride and a half this one. 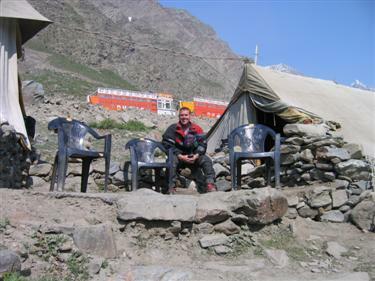 Fly to New Delhi, India then catch a train some 200 miles or so north to Chandighar, then pick up Royal Enfield hire bikes then and ride over some off the highest motor passes in the world all over 14,000 ft finally after 4 days we will reach Leh and make an attempt to travel the Khardung La at 18380 ft which lays claim to be the highest motorable road in the world. 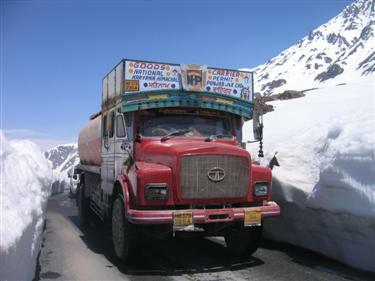 Surviving that we would head west for for Srinagar and discover that all the bad roads were not behind us. 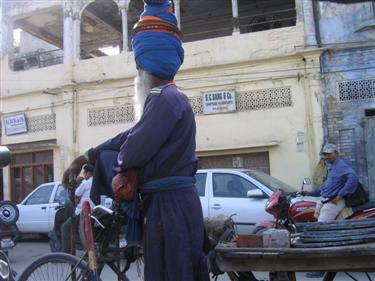 I had always been on the lookout for a adventure that would compete with Morocco , a tour I completed in 2004 and finally I have found it. Oh what a start, after a planned early night that went well out of the window we would manage 3 hours shut eye before it was time for the clock to strike 3 bells and the start of a long day. Den and Billy had recovered well enough by 9.30 to grab a a nice Irish breakfast and a pint or two of Guinness. Arrival in New Delhi would be 10pm, some 10 hours flying time from Amsterdam. However it midnight by the time we had cleared the swine flu doctor, passport control and arrived at the hotel, a nice small place in a strange part of town and all the bars were closed, and we were still awake as UK body clock time was only at 7.30 (4.30 ahead) eventually we found a hotel bar with 4 bottles of out of date beer. Then at 440ruppes we thought we had be taken...time will tell. Honest the bikes will all be as good as this!! Train Indian style,bars to keep them out me in? What a day hot and bothered did not enter into it. It took about 2 hours to wonder about to find the bike district and our dealer (Pay him so he would transport the bikes), who looked in surprise as he had the incorrect date in his book. Problem solved it was time for a hair raising tuc tuc race back to the hotel . Massive confusing from the hotel manager canceling our lunch in wonderful AC conditions we ended up at the station 2 hours early and into a human sauna and a delightfully hot smelly station buffet. However at 80p to feed 5 what do you expect. The train was hot but not as crowded as we had imagined, best of all it left on time, and cost £1.60 each for a 160 mile journey. 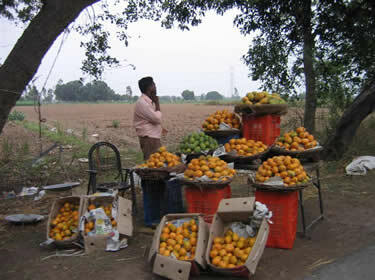 The sights on the way were very much in keeping with scenes from Slumdog Millionaire. Every station would bring hands through the windows trying to sell food and water to the passengers. We are 2 hours in and i have drank 2 liters, this is a sauna on wheels and getting busier. I have to say that in all of the station never mind the train we were the only European/Americans to venture on a self guided package, this is what makes the adventure, stepping into the unknown. As I close the lid on this computer we have been on the train 5 hours plus and a stand still some 13 miles from the station, it's now dark (7.30 the sun goes) I am hungry and ready for a beer we are now moving backwards and been advised by another traveler that the engine has broken down and we can only go backwards until we get to a siding and a new engine is dispatched. Total time 6h 30m. The bikes arrived at 1am and the 2 lads delivering the bikes slept on a chair next too the bikes to hand them over the next day. By the time the bikes had been checked over (something that can not be stressed enough ) it was 1pm before we were ready to roll,how time passes. It would not take long to discover how bad the driving was. 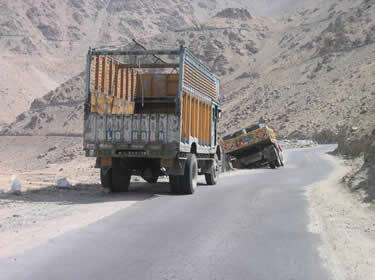 Reckless driving Stepping out on the roads and highways of India is not for the faint hearted. 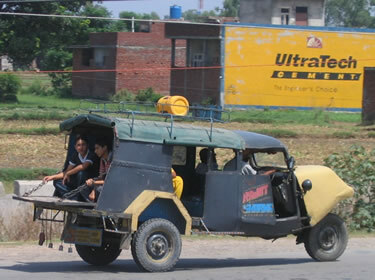 At any given time, pedestrians compete for space with a dizzying variety of vehicles: buses, cars, trucks, three-wheel auto-rickshaws, hand-pulled carts and, of course, the occasional cow. I now understand why it advisable to choose a bike with two horns. This is driving at it's worse I will never again complain about English driving. Now the main problem after the traffic was the heat at a max 46c while riding.Then the cows and monkeys on the road plus the odd dog make for an interesting time. So off we went on 1950s style British bike 500cc single pot producing about 20 bhp at the best of time, also the foot controls are the way round to the now normal. 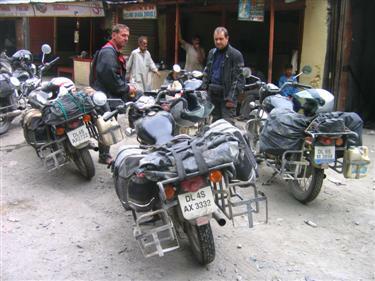 The bikes gave us the first problem and it was my bike with a clutch cable requiring attention, The bike would not come out of gear so would not stop without stalling then with no electric start (that was broken also) required a kick start in manic traffic and heat. The infrastructure here does not exist the place looks like a war zone, only last week a neighbour of mine commented the inconvenience of the water being switched off without warning, here people are by the side of the road using hand pumps and buckets to get it home. The hotel we thought was an example of what was to come so we made do and happy that we had running water and made use of our own sheets on the bed for the first time. Shimla center was wonderful built by the Raj who ran the whole of India from here in the summer the buildings gave you the impression that you were in a town like Chester. Away from the center (one street) it was a shambles. The cleaner in the hotel just opened the window and threw the rubbish out. The 6.30am photo shoot was hard word and waste of time, no coffee till 7.30 and then the Enfield garage did not open till 10am , so all the huff and puff and 5 miles by high noon. Billy's bike required a new clutch cable and battery. The job was completed in true professional fashion and the cost of the clutch cable 81 rupees(£1.10) and the lab our 50 rupees (65p). So at last we were off Neil managed to clip a bike in the car park and knocked it over, thankfully it was an old wreck. Then within half a mile Paul ran into the back of a car I was following and could not understand why he had not stopped. That was until I noticed that the bake caliper had falling off. Then after a lengthy 6 miles Neil broke down with a blown fuse, this was going to be another long one 95 miles in 6h 30m. in terrible heat 49c on the bike and 39c in the shade. By all accounts the temperature was supposed to be dropping by now. A car overtaking me had to cut in at the last minute and managed to hit my engine bars luckily I only ended up in the dirt. This close contact driving is the normal here. I was wearing the helmet camera, and about 20 seconds into the clip you can hear the collision then I end up in the rough. Luckily there was some rough to be had. the driver got a bit of a shock swerved across the road then just carried on. It's all about driving with the 3g's good brakes, good horn and good luck. 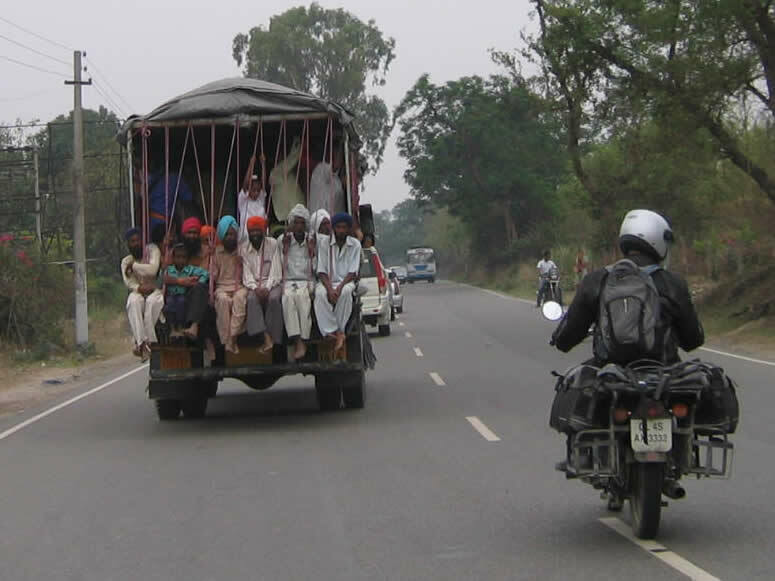 90,000 people are killed on the roads every year in India. it accounts for 1% of the worlds vehicles and 10% of the worlds accidents. The camera used for all video was the Tachyon XC, a wonderful easy to use piece of equipment. Mandi (meaning market) was a busy place but not early built around the tourist so hotels are not a plenty, when we get sorted it was a good clean place at £13 each. The curry keeps getting better, even though it is all veggie. I guess the locals can't afford to keep animals in any grand scale but manage to grow of vegetables. This was to be the time when we questioned if the journey to the top was possible. Well what a day it may have only been 140 miles but it took over 11 hours, we had a good start and decided to fit 2 days into one to catch up for the previous 2 days shortfall. 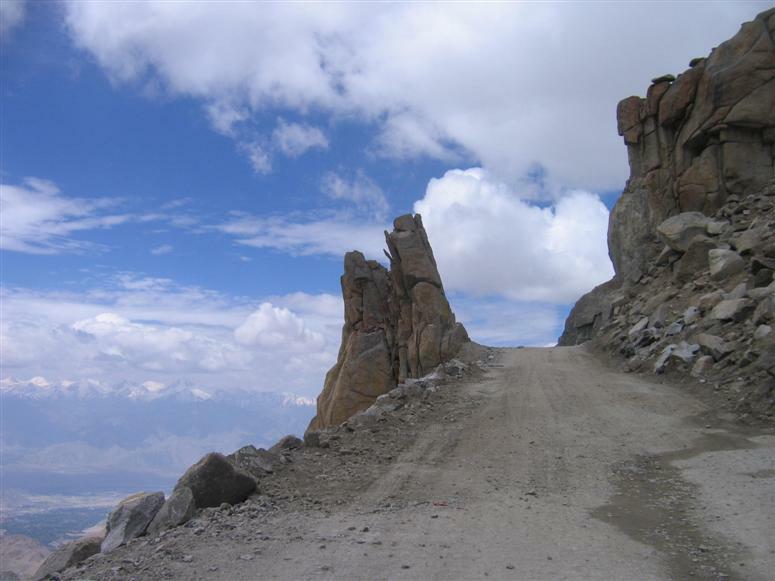 The road to Leh, is an spectacular 296 mile ride, and described as very strenuous(an underestimation as we were to see). It started well but slowly went downhill. 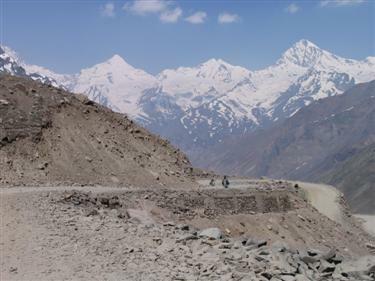 Our stay was short lived and the promise of a night in a holiday inn hotel passed us by as the first big one lay ahead the Rotang La pass stood at over 13 050ft(3978m) this would take us over the Pir Panjal range and onto the Himalayas . Keylong our bed for the night lay ahead only 77 torturous miles away, this stretch took us 7 hours. The roads were more like off road trail roads complete with river crossings and jammed packed with traffic of all types. 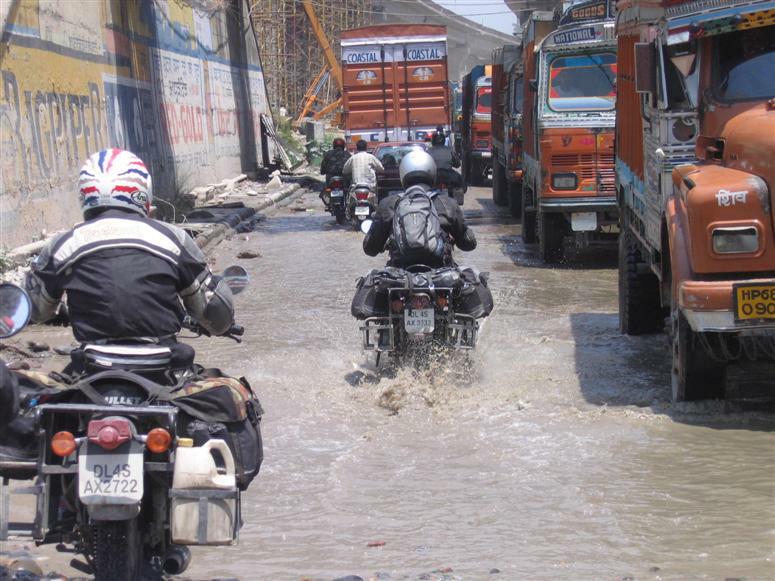 The biggest problem was the constant danger of being run off the road. 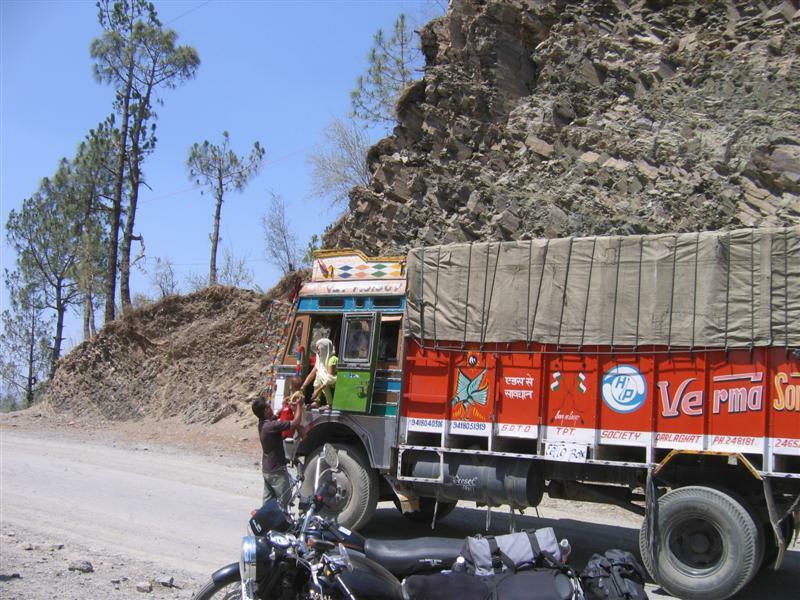 6km before Keylong was the last fuel stop for 230 miles, where we filled every available container. Today's run would be a lesson to us all and a wake up call of what lay ahead. Road gangs, hundreds upon hundreds ..........doing what!! Morning !! Has Neil froze to death? 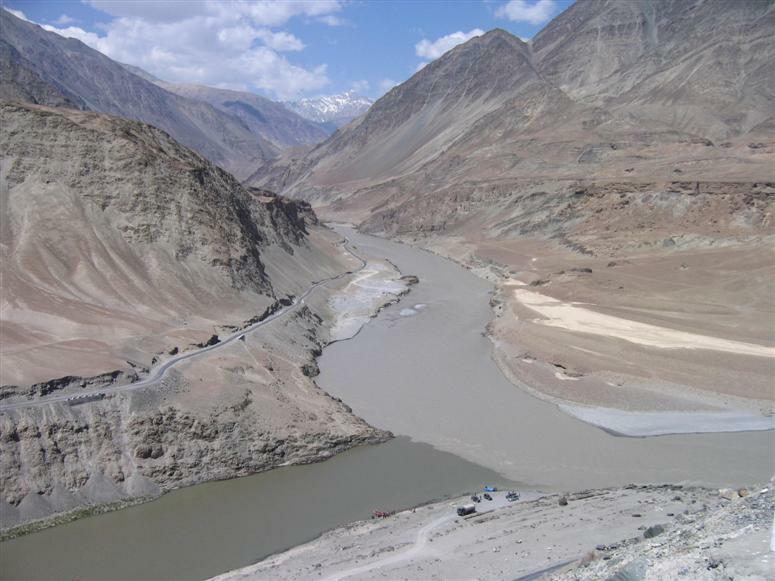 The plan had always been to reach Leh in 4 days or maybe 5 at the most, unfortunately the bad start and progress we had been making put our estimation after 2 days was more like 7 which would prevent us from reaching our goal giving the time we had allocated of 12 days. So after the success yesterday the decision was made to double up again. 7am would see us away and another 3 passes to complete to reach Pang. 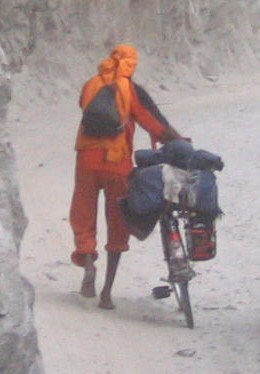 The roads were more or less the same as the previous day a mix of half poor tarmac and half just rock sand water and mud, and 90% of everything single track were he who is the biggest wins, no matter how loud your horn. No wonder it takes so long to cover the miles. The first obstacle of the day was Baralacha La 16,002ft (4883m) before reaching Sarchu a popular tented settlement which is a popular stopping place for travelers on this route,probably the only civilisation you pass after Baralacha La which in comparison to Pang looked like a royal summer residence. Not ours we were doing a double,the 21 Gata loops would take us to Nuchl La ((4900m) and finally Lachalung La 16,613ft (5065m) by now a few heads were buzzing with AMS (altitude mountain sickness) Some found the use of a drug Diamox came to the rescue,others screamed in pain. The scenery improved around every bend, the only danger is taken your eyes of the road. 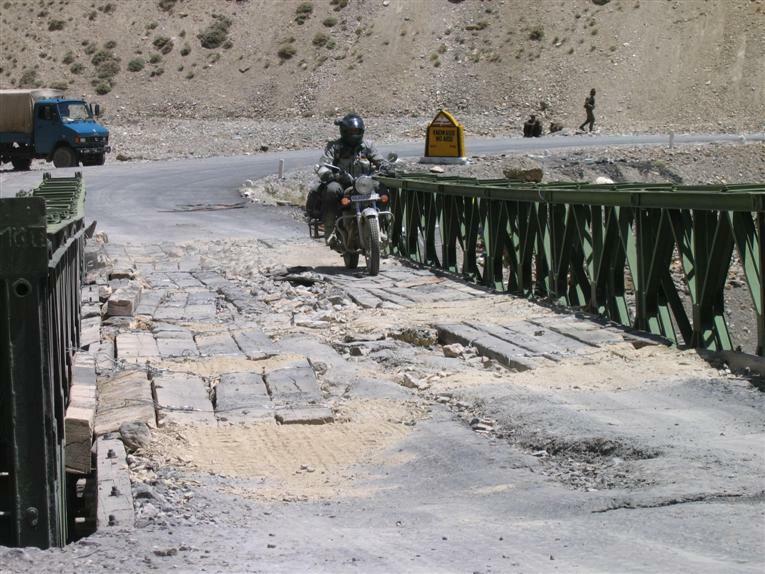 Once you get used to the roads you have the metal bridges with holes in to contend with. Finally the small tented settlement and our overnight was reached at Pang. 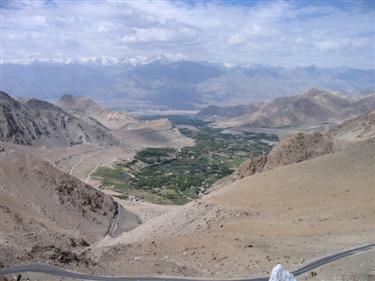 We had now crossed the Himalayas and the next mountain range would be the Zanskar mountains on the way to Leh. We chose a good one 10 mattresses on the floor, no water except from the well, light by battery and no toilet, the ladies have a metal 3 sided shed with no door and a hole in the floor. I have to add it may be poor but it must offer the best view from any khazi in the world. At 100 rupees (£1.30) a night I guess you can't expect the Ritz. Dinner was served in the tent and no complaints cooking 7 meals on one stove. This was also a alcohol free night except for the dehydrated wine we had carried from home. (well recommended). So tired are the crew tonight it was lights out at 9pm. Sleeping at 14800 in a tent would see all the warm thermals appearing for the first time. Boy or boy this is why we carried the warm weather kit, we awoke around 5.30am watching our breath freeze as it hit the air. We decided to sit tight until the sun had rose enough to defrost the seats on our bikes. 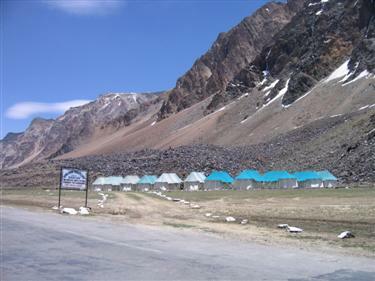 Completing the last lap to Leh was finally on our mind, we were pleased to see a sign informing us that this was the highest transit camp in the world. Den had a problem his head bursting with AMS and was desperate to loose some height, this however could only be achieved by going even higher as this was the only way out. 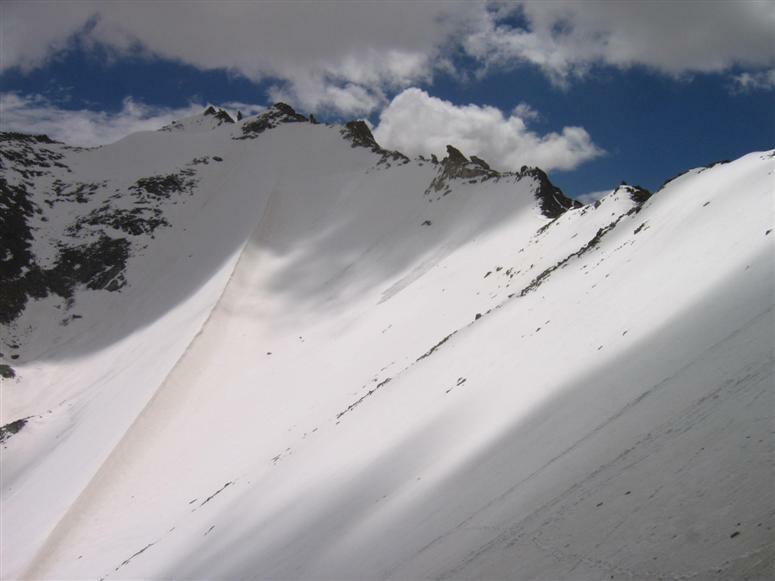 Unfortunately this was the second highest motorable pass in the world, the 47 miles to Tanlang La at 17582ft (5328m) would be easy task, a puncture at 17,130 ft was the last thing he would have wanted and added an stop of 30mins which is something you do not want at this altitude. 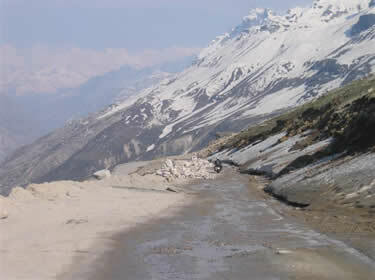 The top offered delight views and photo opportunities, short lived as a drop in altitude was required fast, lulled into a false sense of security tarmac had been laid for the first 2 miles, then a right mixture including a touch of snow would add time to our decent to Rumtse at 14,000 ft and the start of better roads to Leh. The scenery and height changed over the next 60 miles the rock formations were absolutely fantastic .Approaching Leh we witnessed the largest army settlement camps any of us had seen before, and big improvement in the roads obviously for the movement of the troops. Leh is a busy bustling tourist town with more bazaars than you can shake a stick at, the chance tonight to have some decent food and this was well catered for in the abundance of restaurants. The only shock was the cows still scavenging the rubbish in the main street. Oh and the fact the electricity is always going off for hours at a time. As we awoke to the news that Michael Jackson had died the decision was taken as a mark of respect to have a lazy day and recharge are batteries. The mechanics moved in on the bikes to tighten everything that had rattled loose, and that appeared to be most things. Ready for the off. Leaving the hotel Osmala ready for the big one. 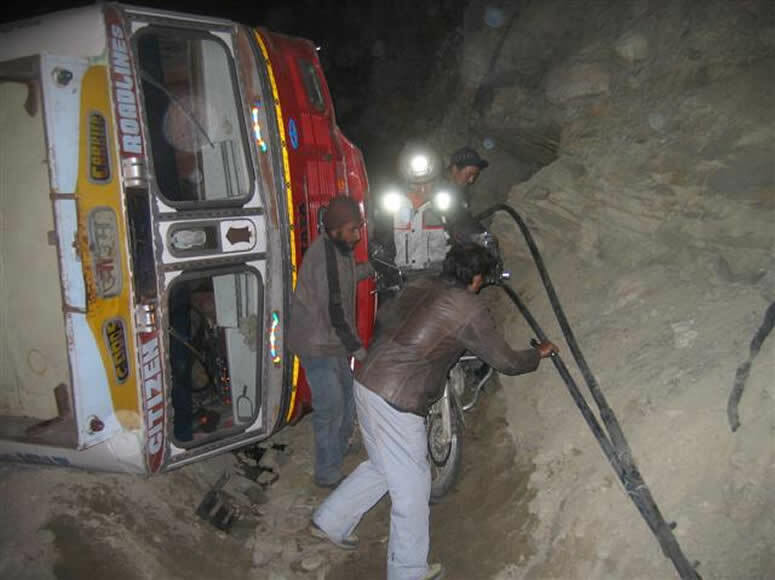 Video of the last leg of our mission to reach the top of the "Karhdung La"
05.00GMT (10.30 local time) five independent lone travels without any backup or support, either mechanical or medical reach the top of the highest motorable road in the world. 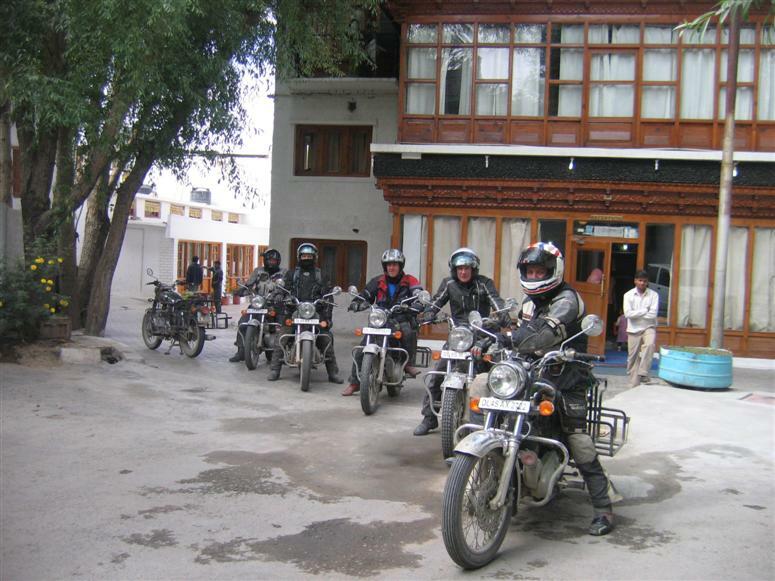 The journey has taken 7 days and has covered almost 1000km on some of the most torturous roads in the world. 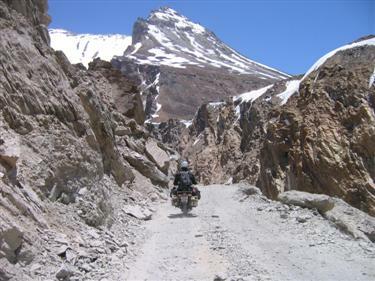 Climbing 5 passes over 13,000ft to reach their goal. The journey to top was to be 25 miles and a height increase of almost 7000ft the journey went well, and the roads quite good in comparison to what had gone before us. The temperature was warm enough to survive with summer riding gear, we shall not complain. 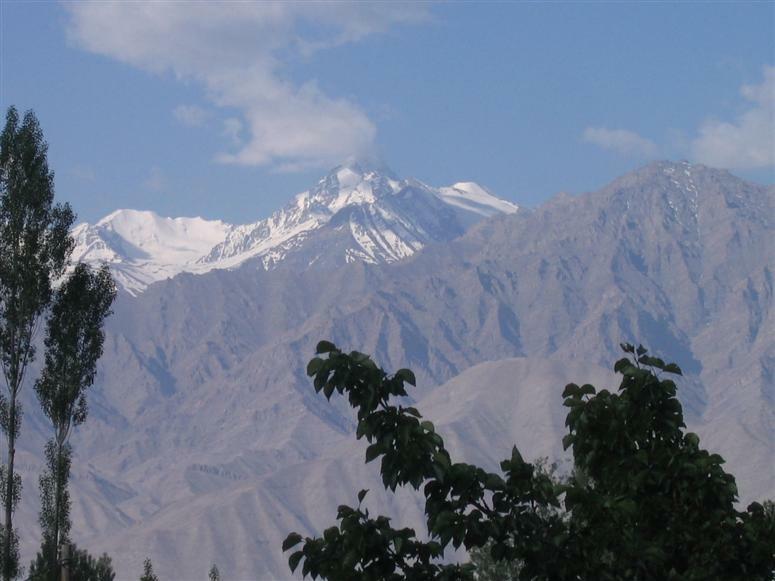 We were on a high having achieved our goal and set a bearing back to Leh, concentrations must have gone by the by when Phil and Den with the tools went charging down the mountain leaving all behind thinking it was mission complete. 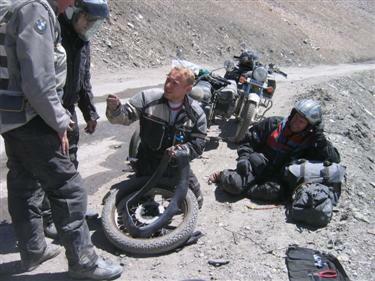 Unfortunately Neil had a dead bike and it was an hour before it was realised that the others were not following. Room on top, just as well thee way these bikes are going..!!!! 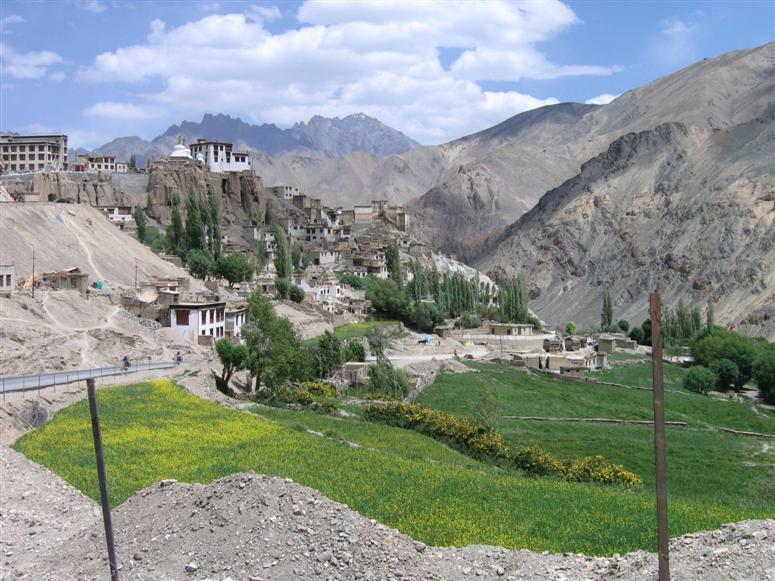 A nice looking village for a change, or is is a monastery? 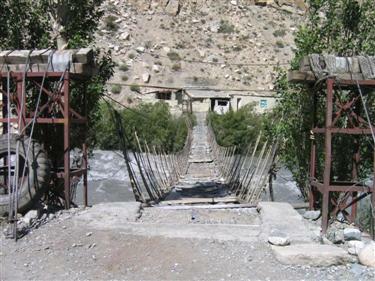 Time to leave Leh and head for home, the decision had been taken to to head west to Kargil and Srinagar despite home office advise it appeared on map to be easier to risk the land mines and kidnap than head back the way we had came. The road was well served with army garrisons as the road comes within 3 miles of the cease fire line and mortar attack did not stop until 2003. 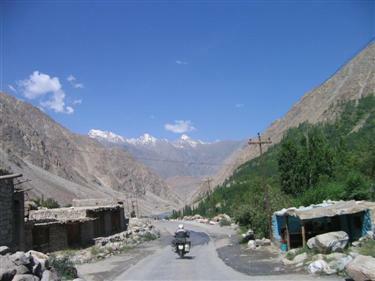 To our surprise the tarmac ran out after 4o odd miles and the next 70 would take us five and a half hours and make 7pm finish in kargil a tiring long day in which temperatures touched 37c. To make matters worse Den picked up his second puncture of the the trip and 40 minutes were spent in the scorching heat. The night was to celebrate Phil's birthday, to our continued bad luck the town of Kargil is strict Islamic Muslim and completely dry. 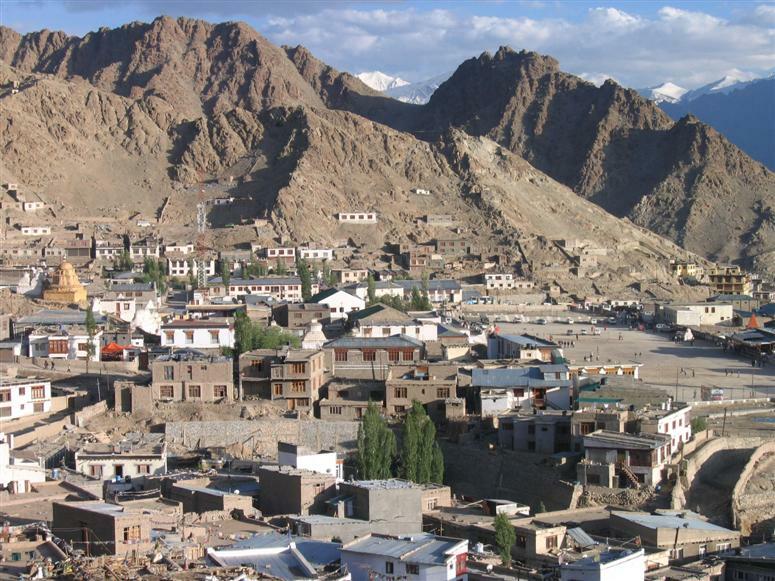 The only reason for stopping at Kargil is that it lies approx half way on the Leh to Srinagar road has a population of 12,000 also the biggest town on route. Woman are never seen outside because of the Islamic restrictions. (Nice place for a stag week end). 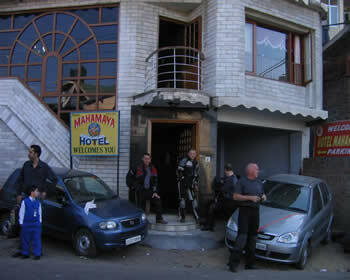 Fine accommodation was found at the D'Zojila hotel which was in the guide as offering plush rooms. I guess a dictionary would be as good addition to a guide book. At a cost of £12 each including dinner and breakfast you could not complain too much. The scenery made the day, the landscape forever changing but always fantastic you almost felt as if the whole place was one big film set. 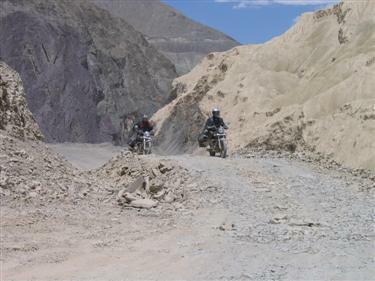 What a road, sand at best, not a crash barrier in sight!! 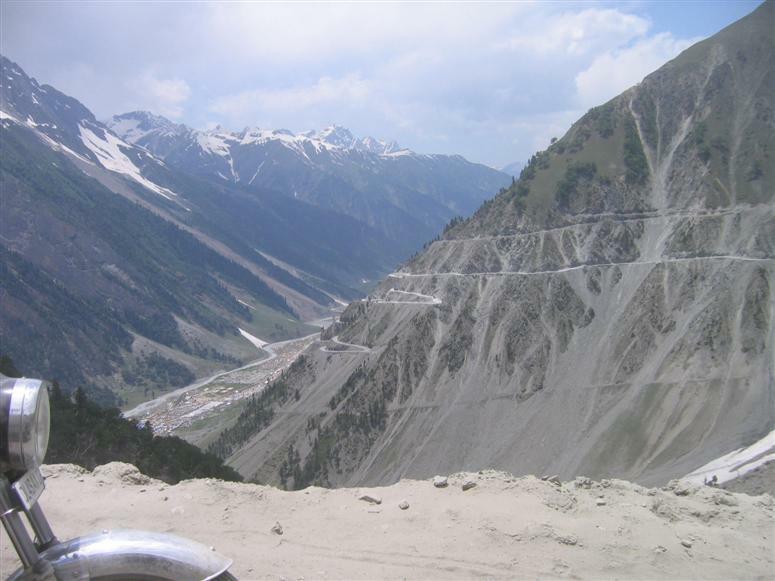 Video of the run between Kargil to Srinagar on the main national highway ?? 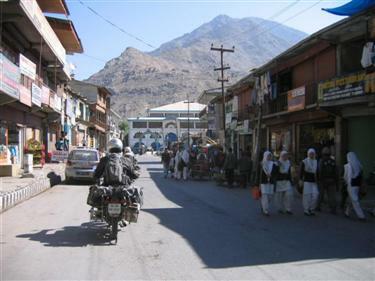 Leaving kargil did not bring a tear to my eye, it was a bit of a dump the town center had nothing to offer. Asking for a spare tube got us a guy offering us one already patched twice. 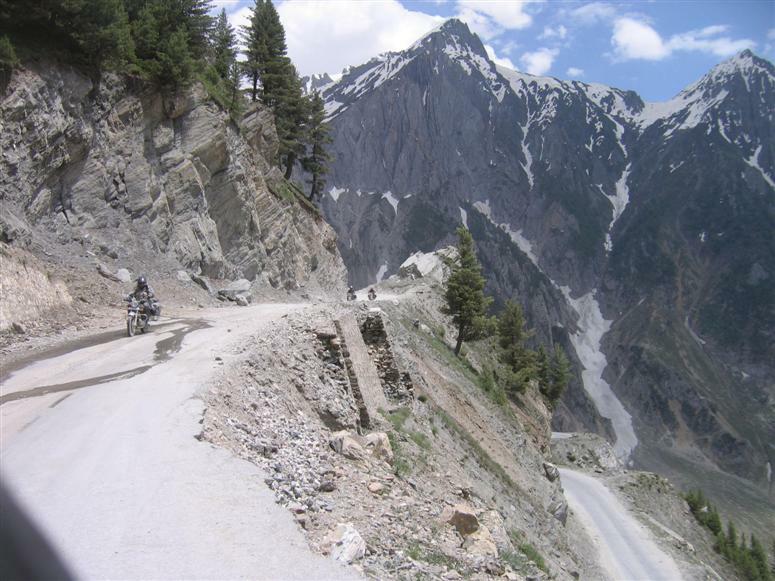 Summing up the day was 130 miles magnificent scenery down the Kashmir valley. The roads were the normal lumps and bumps except for 20 miles over the pass which to experience is a joy to remember and probably never able to forget. But what an experience as I clung to the edge of a 1000 ft plus drop the approaching Tata wagon had an inscription "Trust in God" so I did and I am still here to talk about it. 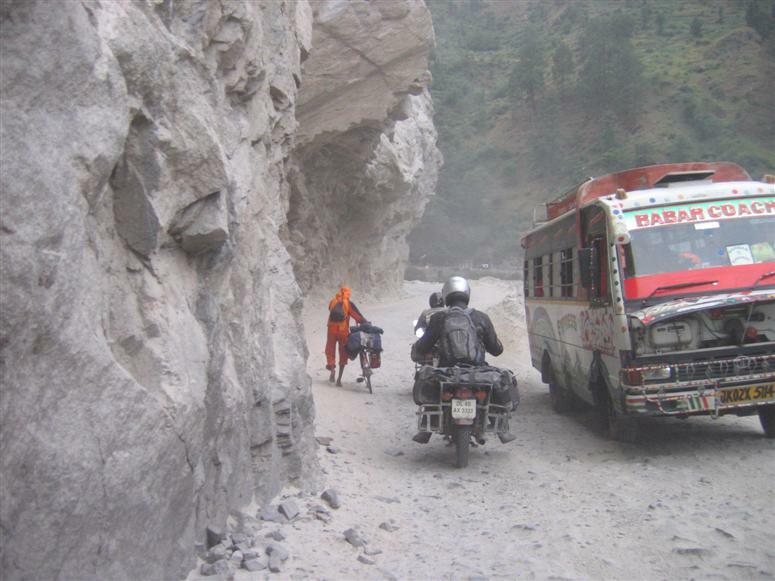 This has to be the most scary road on the trip and the I Indians call it "NH1D" national highway 1, that's a laugh. 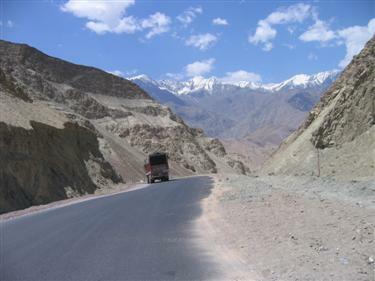 However it bring us back to the other side of the Himalayas and the road to home. 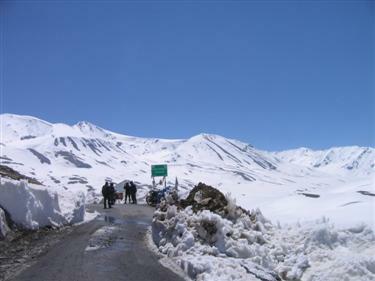 The foreign office advice is not to travel to Srinagar by road, but how else could we have getting there without the road. We witnessed thousands of military personal either in dugouts, watchtowers,checkpoints,hid behind trees or in armored vehicles. Then the convoys of up to 60 vehicles,great obstacles on single track roads. 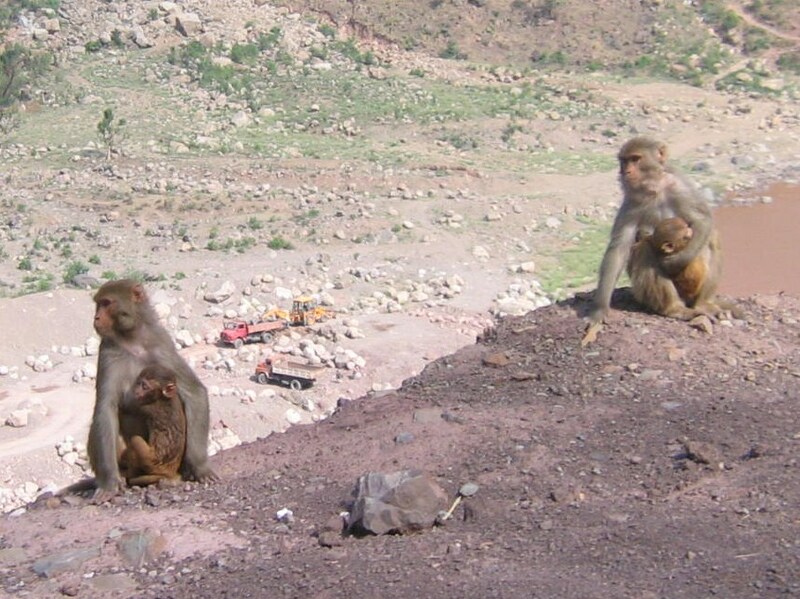 The people also appeared to change to more afghan appearance, riding donkeys herding goats and sheep. 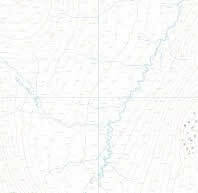 Home settlements were tent settlements in the hills. 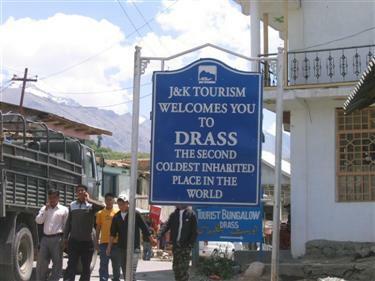 The only town passed of any size en route was Drass (10,660ft), and I have to say a pray that reincarnation did not settle me here. It's claim to fame is in being the second coldest inhabited place on earth at average winter temperatures of -40c, yet in January 1995 they managed -60c. It was also here that a vicious war was fought as late as 1999, many memorials stand along side the roadside in memory of the falling ones. 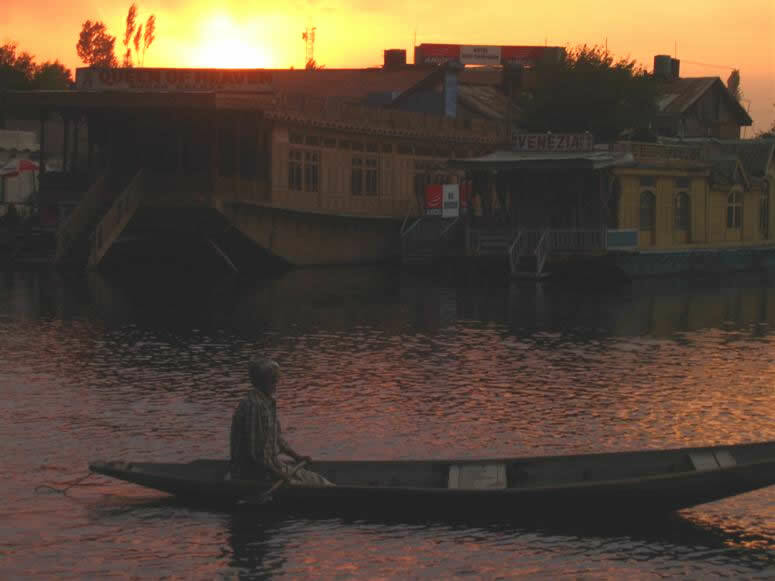 The city of Srinagar was visited briefly by taxi in the last light of day and it has to be the most tensioned place I have ever visited, as night fell the tension increased and the city was emptying very fast including ourselves. The accommodation found opposite the houseboats was a feeling of returning to normality and at a cost of £16 was expensive by Indian standards but not by ours. 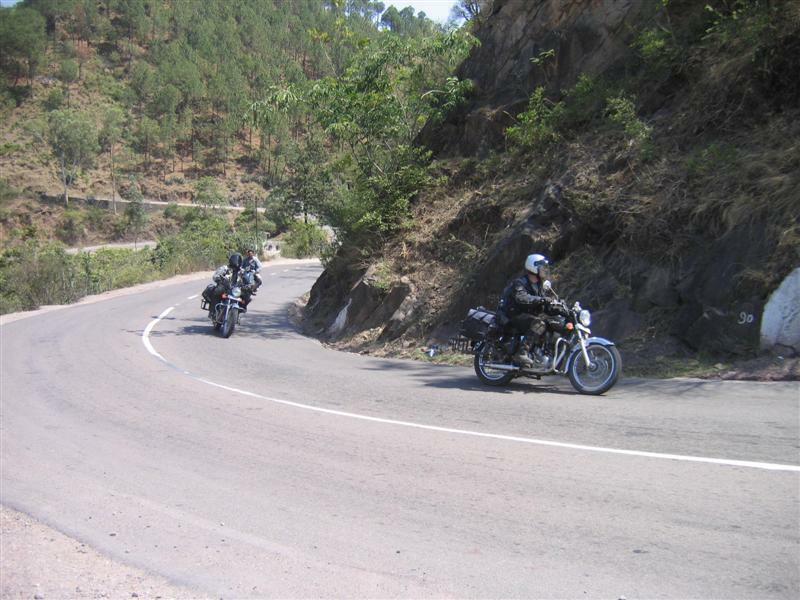 A video showing the run down from Srinagar to Jammu ..What a nightmare run!! 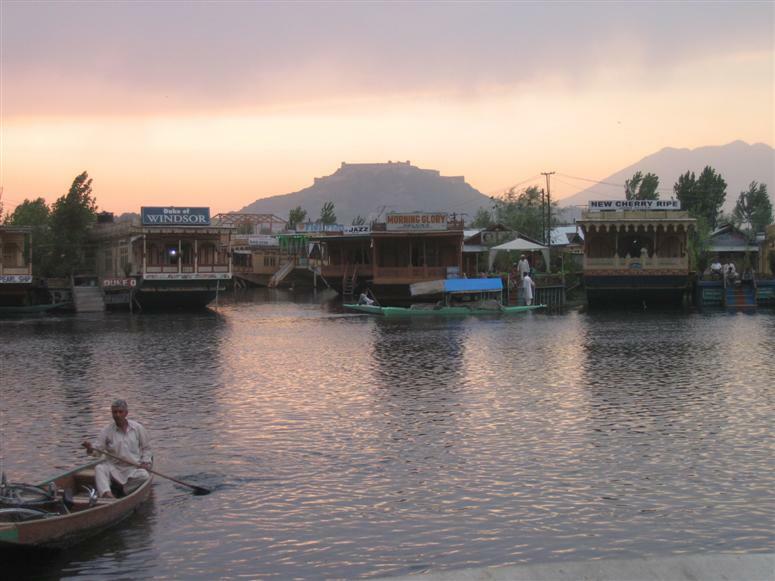 Somehow we had a day in hand and the original plan to spend it in Srinagar was long gone after what we had witnessed the night before. The whole country is on a state of alert. The run south to Jummu was not an easy one it may have only been 185 miles but the roads are so busy and the drivers mad. In all the distance covered it was noted that not one clean inviting stop was noted, only the normal dark dingy doubtful indian shed, the crisps and bottles of coke are normally safe. 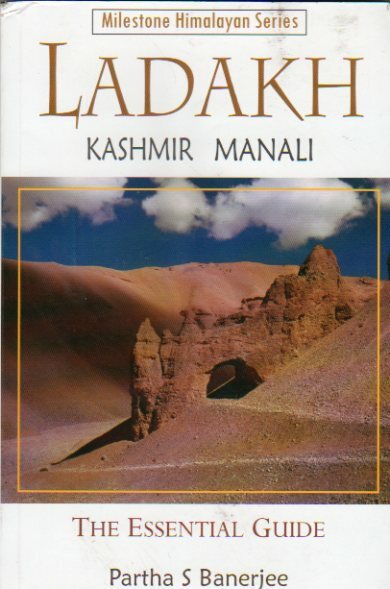 The Kashmir valley did not live up to it's reputation of looking like paradise, especially from the road. 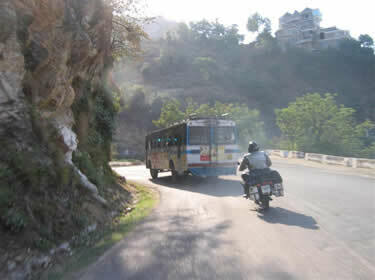 On arriving at Hotel Asia in Jammu, a good hotel with beer all for £15 a night. 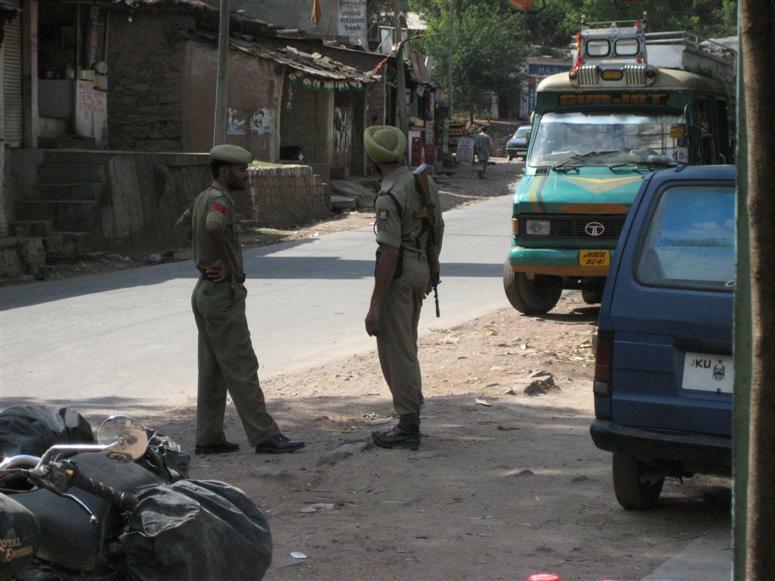 We hear on the world service that shoots have been fired in Kashmir, no surprise on that one. 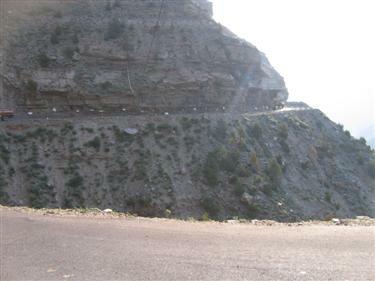 somehow the day in hand vanished, the progress on these roads is so slow that we decided to cut the last day into two. 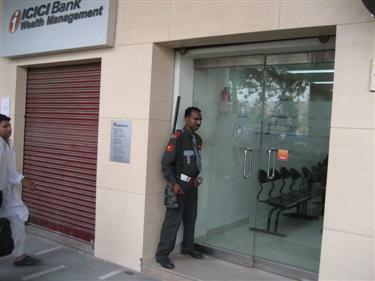 Just as well as we did not get into a hotel in Jalandher till almost 6. Today was just plain driving, no views as the mountains are well behind us now. you still can't relax for an second as the traffic is so intense. The highlight of the day was probably seeing a McDonalds which sort of stood out from the usual squalor that ardors everywhere else. 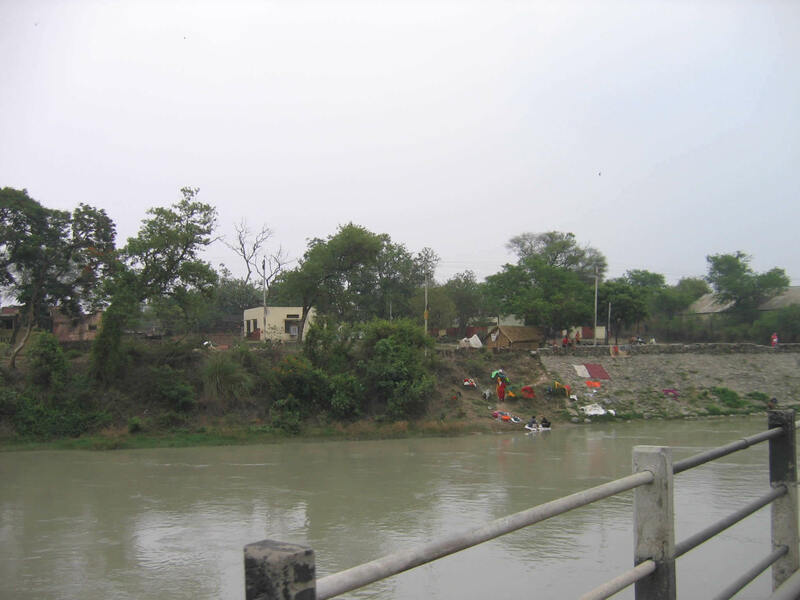 The bad light was the burst sewer pipe that caused over a foot of sewerage to drive through at Pathankot. The last day on the bike a simple run of under 100 miles, well it would be simple if all the Indians did not drive like morons. It still managed to take us over 4 hours, but at least we were all back safe. In a way it was a pleasure to pull back into the hotel car park and only scare being a breakdown on Phil's back 12 miles from the end. A quick clean of the plug and fuel jet had us back on the road. All that remains now is to find a beer, have a good sleep and a nice taxi ride 160 mile back to Delhi in the morning, then it will be the big bird home. The driving would be bad, wrong,it was the worse than bad YOU CAN'T EXPLAIN IT!!! It is one of the best adventures you can do on a motorbike,also true VERY TRUE!!! 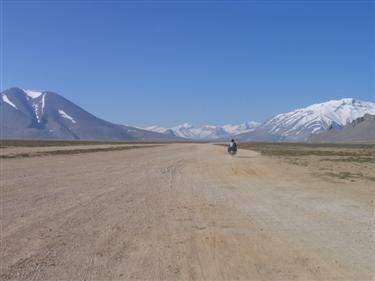 This has to be the best 2 week adventure on a motorcycle that the world has to offer, you see so much cultural change alone to last a lifetime. 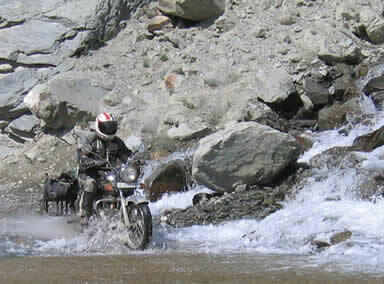 Then the motorcycles bring their own blend of adventure on their own. 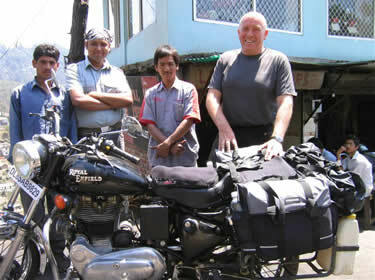 Doing the journey on an enfield is something that has to experienced. 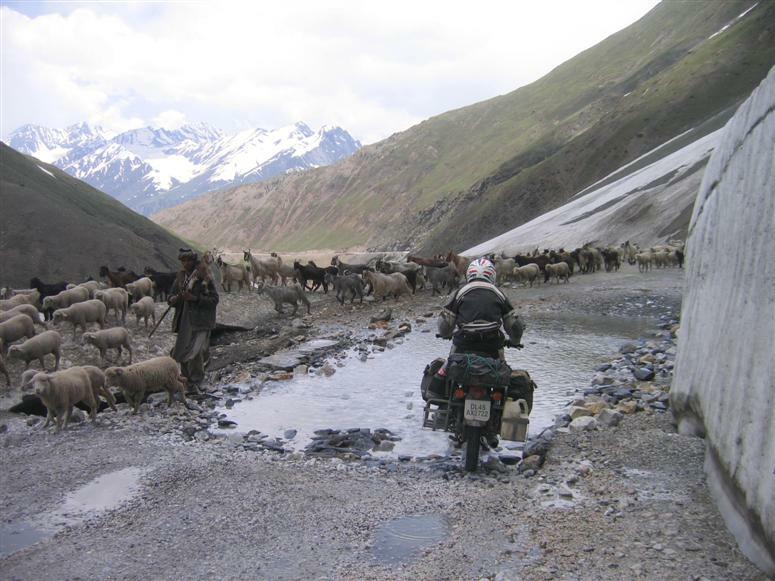 The adventure also brings you a target in achieving to ride on the highest motorable road in the world. which by itself would have made for a great journey. But then its placed in such beautiful surroundings that it becomes too much to take in. 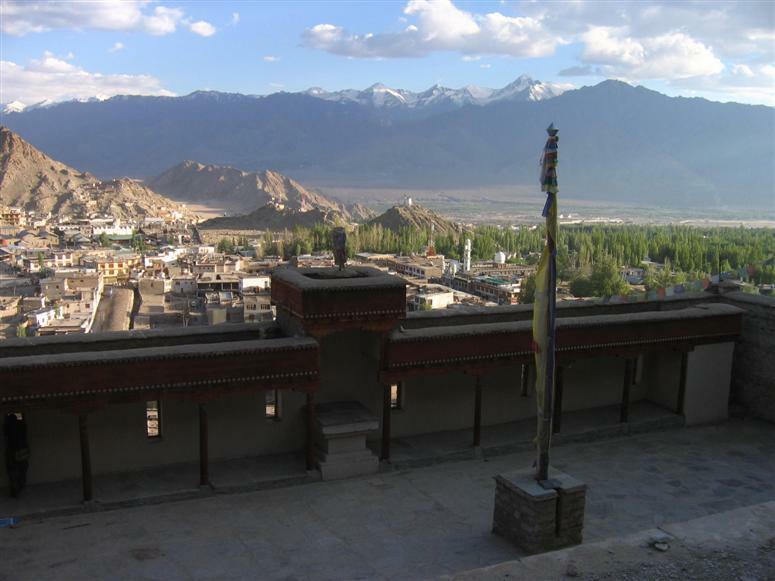 The pass is in a region of India called Ladakh which is also known as "Little Tibet" and provides its own cultural change, which helps make it special. Lastly though the one thing that will live with you forever is the driving. No not for the skill developed to negotiate the high passes while trying to look hundreds of feet to the valley bottom or the many river crossings you negotiate. 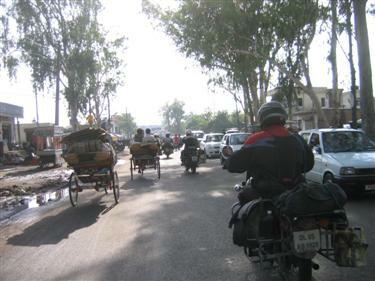 It will be the driving standards of the Indians charging towards you, you realise that they give no special consideration to bikers you are just an easy target and you will move out of the way or die. All in all a lot of work required to cover the 1282 miles, however they will live forever. 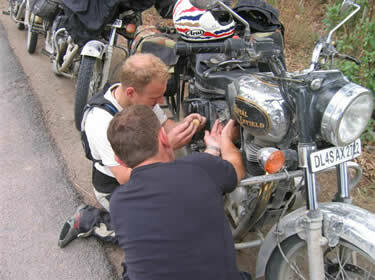 Oh and if you do follow in our footsteps, please ensure that every nut and bolt is checked on the bikes before you set off on your great adventure.....or it may be your last. And last but not least !!!! Beware of the hotel pets !!!! What did the comments on BCM Touring say ? ?